I have to apologize to you guys because I had anticipated flooding you all with updates. However, that has been delayed due to unfortunate circumstances behind the scenes here at VNs Now HQ. To that end, I felt it best to bring everyone up to speed on the situation before we move into NaNoRenO because this type of behavior is the worst o not just our little community, but the gaming industry at large. We’ve seen it with Angry Joe and TotalBiscuit, now a much smaller entity is determined to not only silence any critique, but also to threaten decent people whose only crime was asking a question. I am not a decent man. I try to be, but I am not. I have said things in ways that I’ve regretted and have paid a hefty cost for it. However, I have come to the conclusion that this report must be delivered to you all, in full, for reasons that will become clear as we get through it. This is a full and complete report of the lengths some people will go to in the name of their own vanity. Some names have been redacted and are protected by free press laws here in the United States while others are pseudonyms of peoples who, by legal right, do not need to reveal their true identities to the public. All other information is protected by both national and international law and all who commented as a part of this story did so of their own will with the full knowledge of the rights of VNs Now to publish their comments. Finally Will Wellemeyer contributed to the tail end of this report, while the main research and writing was done by your’s truly: JP the 3rd. With all of that said, it’s time to talk about the resumed adventures I am having with Grant Wilde and the team of Always the Same Blue Sky. I’m 99% sure that Always The Same Blue Sky art is traced from an Atelier Totori key visual by Mel Kishida. How do I sue them for making money from that? Well let me first answer your question and then comment, because you’ve made a very serious charge amigo. The key thing here is that you cannot sue for anything because Atelier Totori isn’t your copyright. You can raise some noise but legally speaking, only Mel Kishida or NIS America can file a copyright claim. And they would need prove beyond a reasonable doubt that there is more than just a passing coincidence between their promotional art and ATSBS’s promotional art. So it wouldn’t be a simple task, unless Wilde or one of the project’s artists admitted to tracing. So that’s the legend[sic]end, now for the comment! I’m assuming that you meant the promotional art for both games and not their in-game CGs because I didn’t know what Atelier was until you commented. But looking at Atelier’s promotional art (http://arminos.com/wp-content/uploads/2013/11/atelier-dress-kishid-rorona-totori-wallpaper-anime-images-atelier-totori-hd-wallpaper.jpg) and ATSBS’s main menu screen….it is uncanny. That doesn’t mean it was traced. It’s just uncanny. Grant Wilde may just be a big fan of the series and was inspired by it as many of my commissions have been. But there just isn’t enough on the surface to say it’s traced or otherwise encroaching on other’s copyrights. And I say that as a guy with PLENTY of issues with this game. I don’t think art theft isn’t one of them. Thanks for your comment! Another reader here who also noticed the Atelier Totori resemblance (I have the official artbook). The picture you linked is a cropped photo of the full promo art. I lined up both pictures in Photoshop. It’s kind of hard for me the scale the pictures (being a picture from the book), but the eyes, face, ears, shoulders, back, fabric shading on the skirt, and legs are almost a perfect match. Not asking for your crew to do investigative reporting or anything, but I would be very interested in knowing the about the artist’s “influence” for the VN in question. If you noticed, more than a month has passed since G’s comment and most of it was because a part of me wanted to keep it quiet until I thought it through, but a recent comment from someone who asked for their name to be withheld brought up the question and asked if I intended to provide some sort of an answer. The importance here wasn’t about the game in particular or even the history between this very site and Grant Wilde, but rather the ensure that commercial property developed in this medium, one of the easiest mediums to infringe on due to the art style, is above questions of intellectual property. So I decided to approach several people I knew within the digital art community on the issue as well as my friends in Georgia’s legal community. I showed them the two images as well as the test done by G and they unanimously reached the same conclusion: that there was substantial similarity between the two images; with a few even alleging it look closer to being traced. But, at the same time, I knew the only way to be fair is to inform Grant Wilde of what has occurred. If there was even the possibility of it being a misunderstand or if Wilde was unaware of something his art team did, he deserved to know. I am the reporter for the website VNs Now! and it has been brought to our attention that some of the art assets in Always the Same Blue Sky(specifically promo/menu art: http://projetsaya.fr/wp-content/uploads/2013/08/ATSBS-main-menu.png ) may be substantially similar to, and even traced from, promo art of the game Atelier Totori, developed by Gust and published internationally by NIS America and Tecmo Koei. 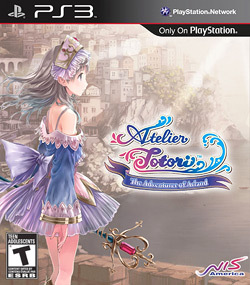 (Cover art for the PS3: http://upload.wikimedia.org/wikipedia/en/c/c8/Atelier_Totori_US_Boxart.jpg)This could create a serious legal issue with the copyright holders of Atelier Totori. We’ve reached out to various artists for their opinions on this matter as well and there does seem to be consensus that this is a problem and that the case for substantial similarity is probably strong. So now I must ask, was anyone on the team aware of this situation? What actions do you intend to take in regards to this issue? Can you advise by return that you have the authority of the companies you mention to make the serious allegations you have against me personally and my organisation as I have spoken to my attorney who will be contacting the owners and main shareholders of those named entities regarding your defamation accusations to hold them fully responsible for all consequential losses and damages caused by said accusation. By return please advise your full address, company style and legal representative as this is the second time you have caused serious reputational and commercial harm which I now intend to pursue through legal means. I appreciate your timely response. It will be considered your official response on this matter when the story is reported. The report is not an accusation nor is it a legal claim against you or your enterprise. However if you do have any complaints or issues please direct your legal team to Ishmaelic Arts, Inc. I consider your response as your confirmation that you officially represent the entities. I will now hold them fully responsible for your actions and all consequential losses caused (included defamation). Please give your full registered address and legal representative details for acceptance of writ. I now regret asking Will to ask the questions that we hoped to resolve. Professional journalists get paid a great deal to do what he did and, to my everlasting shame, I cannot offer him a dime after having to put up with Wilde’s harassment and threats to his financial well-being as well as his name. To that end, we both agreed that it was in his best interest to take some time away from the site for the immediate future. I also want to publicly apologize to Will for putting him in that situation. And I am also demanding a public apology to Will Wellemeyer from Grant Wilde for his harassment of Mr. Wellemeyer which was both unprofessional, cowardly and illegal. So, in short, it seems like this is to be a legal issue. To that end, here is what is going to happen as far is this site is concerned. Everyone on this site has acted in a manner most major press organizations wished they could. If Mr. Wilde is serious about his threats of legal action, he is more than welcome to file any charges he feels are appropriate against Ishmaelic Arts, Inc: the parent company and legal entity this website is housed under. We will report on any further harassment of our volunteers or legal action as it is deemed necessary by the Editor-in-Chief: me. Any action from NIS America or the other legal copyright holders of Atelier Totori will be determined by them and, if deemed necessary, we will report them here. Mr. Wilde’s assertions that this site has caused ‘reputational and commercial harm’ is outrageous. If this is Mr. Wilde’s true view of commercial enterprise, then he is asserting the belief that no one has a right to critique his work publicly because he has the God-given right to make money and that right cannot be interfered with. To be fair, is shared by several major gaming producers, but just as many internet personalities have shown over the past few months, this is a monstrous lie held only by the most cowardly and foolish of creators. We have a right to express our opinion and to ask questions when our audience comes to us with a concern they find serious. That right was established in this country under something called the First Amendment, which is where any legal action against the parent company of this site would take place. And to answer the question from the audience: yes. There is clearly substantial similarity between the two images. Anything more than that is up to the public to decide. I cannot promise this won’t come up again in an angry podcast rant, but unless it is either that or need to know information, I consider this matter closed. Regular updates will resume soon, just know for now that it’ll take a lot more from threats from the other side of the Atlantic Ocean to force this site into silence. If I take the time to report when I’m wrong, then every other serious issue brought before this site deserves, and will receive, a full and fair hearing where all will be treated fairly; but the truth will always be reported. Founder/Chief Executive and Editor, VNs Now!